The “Whirligig” represents exceptional care, unwavering compassion and treating each child as if they were the only child. The white star within the center of the logo shows that the child is our singular focus. Dayton Children’s Hospital reveals a new brand identity to reaffirm its mission, vision and commitment to kids and the community, propelled to provide the very best specialized pediatric care, close to home. The new logo is a whirligig – a spinning circle of colorful ribbons linking all caregivers, those inside the hospital as well as those outside the walls, to the child – the star at the center of it all. This is a pivotal time for Dayton Children’s. The hospital is engaged in an historic change – recruiting the best specialists from around the world, engaging in revolutionary research, revitalizing the hospital's campuses, expanding into outlying communities to be close to home for families, championing advocacy for children’s health issues, and offering more services in more places than ever before. “Dayton Children’s is not the same hospital it was, even just a few years ago,” says Deborah A. Feldman, president and CEO. “Through extensive research and brand surveys, we realized that our image in the community did not keep up with the evolution happening inside our walls. The inspiration for the new logo comes from Dayton’s history of innovation in flight and connects to the hospital’s new design theme of “things that fly.” As children, the Wright brothers were inspired when their father brought a toy whirligig to their Dayton home. It seemed to defy gravity, floating when it should have fallen. Their awe ignited a passion that would change the world. Dayton Children’s passion to care for kids is just as strong. The Neef family’s experience shows the momentous changes are not only in bricks and mortar, but in the people inside the buildings. In the past few years, the hospital made amazing advancements and continues to build on these achievements. Dayton area firm, Graphica, designed the new brand identity. In return, because Graphica’s employees are so supportive of the project, they donated a portion of their services. "The rebranding initiative has been one of those projects that has personally energized us," says Cindy Schnell, vice president of Graphica. "We are excited to be part of the transformation of the hospital." It’s that generous support and community commitment that so often takes a project at Dayton Children’s from good to great. 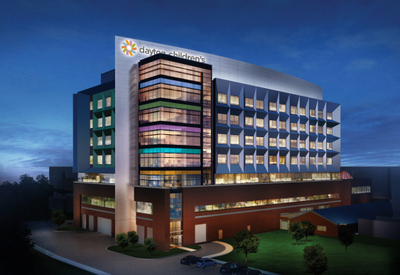 See the Dayton Children's Hospital brand promise. One of only 45 independent freestanding children’s hospitals in the country, Dayton Children’s is the region’s only medical facility dedicated to children. Accredited by The Joint Commission and serving 20 Ohio counties and eastern Indiana, the experts at Dayton Children’s care for 300,000 children each year. Consistently recognized as one of the country’s best and most cost-effective pediatric hospitals, Dayton Children’s is home to the Wright State University Boonshoft School of Medicine, Department of Pediatrics and together with the United States Air Force shares the nation’s only civilian-military integrated pediatric training program. For more children’s health and safety information, visit our web site at http://www.childrensdayton.org.